Its confession time dear readers: When I started this review I wasn’t sure where I was going with it. “Minions” is one of the best examples of a movie that has mixed results, where whether it is good or bad can be because of something so small, that the star grade won’t really matter without context. Indeed, it is times like this I wish more people read reviews rather than just look at the stars and Rotten Tomatoes score, because for a movie that is so simple in nature, the actual recommendation is one of the most complicated ones I’ve had to write this year. Anyway, while I was writing my original review I was snacking on Cheese Nips, which happen to be shaped like Minions at the moment. When I looked at a handful of the tasty snack I was about to eat, it dawned on me how much all the crackers looked the same. On the box it shows that they’ve included five different Minions, yet the differences on the cracker designs are so minor, you’d have to be looking really close to be able to tell them apart from one another. It was at this point I scrapped what I had written and started over, because this is where I realized what my major problems with “Minions” was: The Minions, despite being very funny at times, have no distinguishable traits to make it easier to tell them apart. Alright, Kevin is taller than the others, so it’s easy to spot him, but that’s about it. Otherwise they are all yellow, short, and speak in utter gibberish. 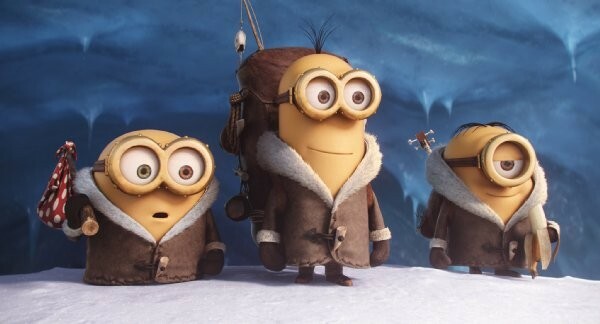 In fact, when “Despicable Me” opened several years ago, I found the Minions to be this big, elaborate joke, where it didn’t matter what they did or said because they were simply there to support their master, Gru. 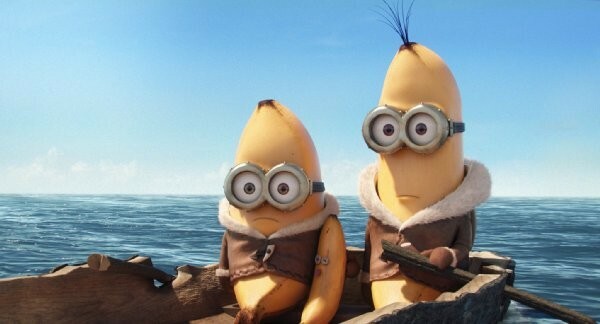 Because people found them funny they had a bigger role in the sequel, and now they have their own spin off (prequel?) movie. 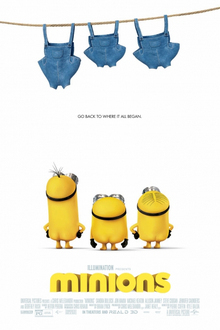 So what is the story in “Minions?” What does the screenplay give them to do? Nothing. The whole point of the movie is that without an evil master to serve, the Minions have no purpose in life. By extension, without a master to serve, they have nothing to do in this movie except look for one. I had to laugh at the beginning of the film when a narrator had to explain what was going on. Because the Minions speak gibberish, and their personalities aren’t strong or diverse enough to properly express what is going on. 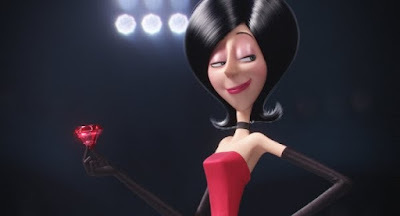 The narrator takes a notable leave of absence when the Minions decide to serve a supervillain named Scarlett Overkill (Sandra Bullock), who wants to steal the royal crown from the Queen of England. I liked Scarlett better as a character because, well, at least she HAS a personality! Sadly, she isn’t given much to do most of the time, which is a shame because Sandra Bullock is a funny lady in real life, and it seems like such a waste that the screenwriters couldn’t figure out how to make the most out of her personality. Now then, it should be noted that this is far from a terrible movie. For all the flaws in the storyline, it has lots of funny moments, and I did laugh a lot. Most of the laughs were merely chuckles, with only a few moments of laugh out loud hilarity. In truth, “Minions” provided the same amount of enjoyment “Despicable Me” did, but this time I can’t quite bring myself to give this a passing grade. Yeah, I acknowledge that most people enjoyed the Minions the most in those movies. If they didn’t we wouldn’t have this spin-off. I must admit though, like most side characters that get promoted to starring roles, they aren’t funny or engaging enough to carry a feature film. 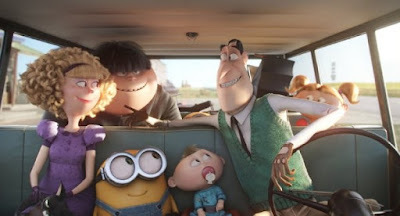 For all of his contrived moments, Gru was simply a much better character than the Minions. He had real personality, he had motivations, and his character evolved over two movies. Sure they weren’t 'great’ movies, but they at least functioned as decent entertainment. 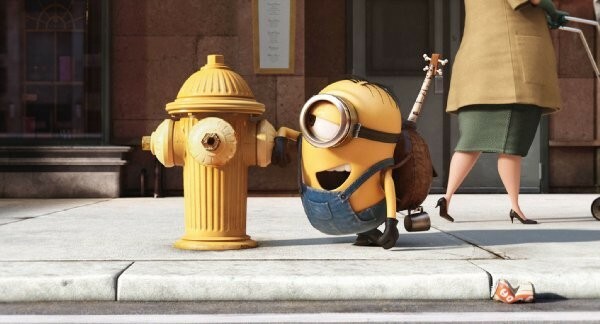 “Minions” feels like a half hour special that has been stretched to over an hour. Like these tasty Cheese Nips I’ve been snacking on, the movie is tasty, but only for short periods, with none of it filling in any way. I have no doubt kids will enjoy it and lots of toys will be sold, but I want to point out that “Inside Out” is still in theaters, which is much more funny, and has a story that was worth making a movie out of. Parents, there are a few bare Minion bottoms and jokes about their breasts being exposed (with the joke being there is nothing there to be offended by). I don't know, I'm going to recommend ages five and up, but I'll leave that choice to you.